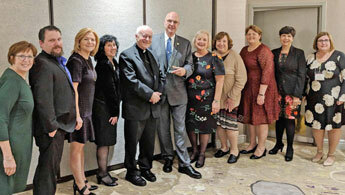 At the annual fall gathering of the Catholic School Administrators Association of New York State, Dr. Thomas Chadzutko, superintendent of schools for the Diocese of Brooklyn, received the Lighting the Fire for Catholic Education Award. 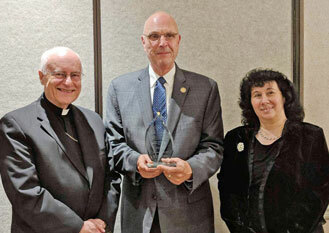 He was recognized for his outstanding contributions to Catholic education, for inspiring others to achieve and contribute to Catholic education in their communities and for his authentic leadership, which continues to be a force for positive change for Catholic education in the Diocese of Brooklyn and Queens. Holding his award, Dr. Chadzutko, right, is congratulated by Auxiliary Bishop Raymond Chappetto, vicar general for the diocese, and Diane Phelan, diocesan associate superintendent for evaluation of programs and students. Dr. Chadzutko, seen below, center, is honored to have the support of his colleagues who work alongside of him in the diocesan Office of the Superintendent~Catholic Schools Support Services and also in the Catholic schools and academies of the diocese.